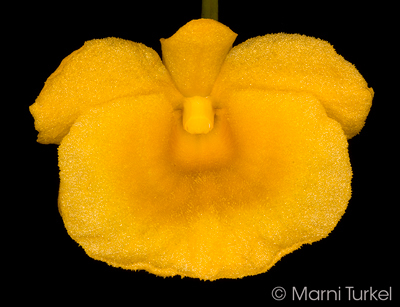 Dendrobium jenkinsii outcross #1494 ('Christian' x 'Juan') (approximately 25 seedlings per flask). The Species: This plant grows from Nepal and India through the Himalayas to China and is usually found at elevations of 2300 to 5000 feet. 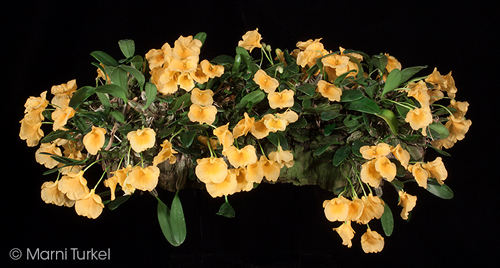 It is a compact plant that grows as an epiphyte. Summer monsoon rains are heavy as is the humidity with less rain in the winter. 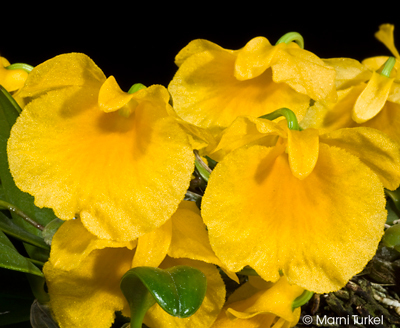 The pendant inflorescence carries 1 to 3 flowers that are a clear golden yellow. Culture:The summers are warm, shady with a lot of water and regular fertilizer. Winters are brighter, cooler, and drier. Water to prevent shriveling. After flowering and as new growth begins, increase water and fertilizer. It is fairly adaptable to varying temperature conditions. This plant was grown with 42F minimum winter nights and very dry. I have seen people do very well with it in an intermediate greenhouse during the winter. I cannot bloom it without a dry winter, but others seem to be able to.